My last post looked at stair design in favelas in São Paulo, Brazil, and how spatial constraint, material availability, and communal negotiation impact design. This post will look at another aspect of self-built environments in the same context – semiprivate buffer zones or transitional spaces between the street and the private residence. The street pictured above is located in Diadema, a municipality that is part of greater São Paulo. The settlement was originally an agglomeration of shacks in a steep ravine. 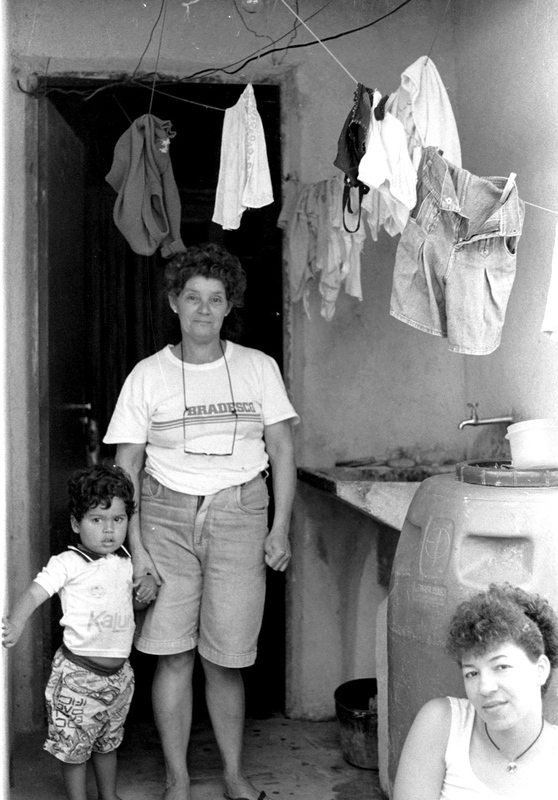 The municipal government, led by the Workers’ Party, had redistributed legal lots to the original residents and upgraded the utilities, and by 1996 it was in the process of becoming a lower-middle-class neighborhood. Due to the spatial constraints on the settlement, each family’s lot was only about 11 by 45 feet, and circulation paths were narrow. The density, lack of privacy, and animation at the street level can be seen in the photo above. As a way of mitigating density, strengthening security, and providing semiprivate outdoor space, a large majority of the houses (about 80%) had a semiprivate, usually gated, outdoor transition zone between the street and the entry door. Many of these spaces served laundry or other utilitarian purposes, and they were often made beautiful with potted plants and birdcages. 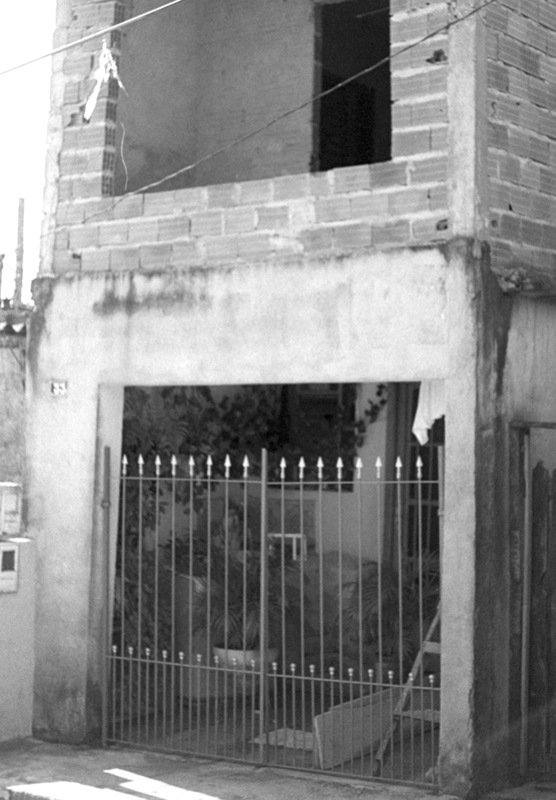 In another legalized favela, near the University of São Paulo, I also observed examples of this kind of buffer zone. 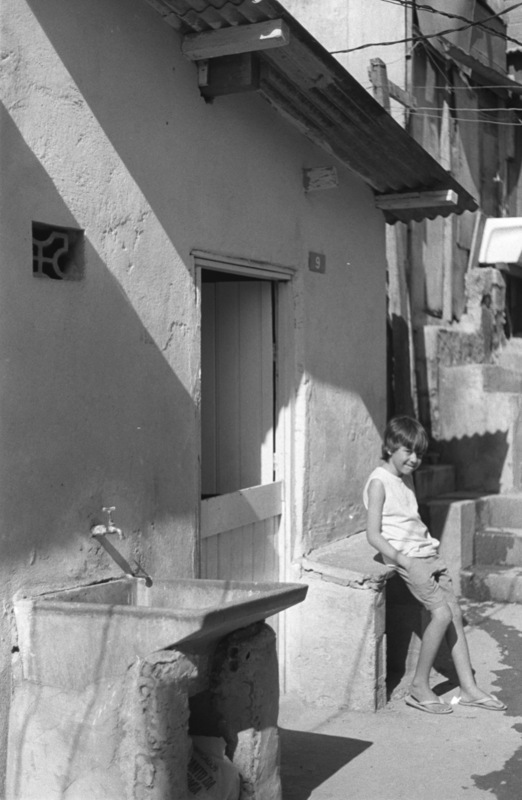 In São Remo the lots were of varied shapes and sizes, and the boundaries of the transitional space were not always well defined. A few lots had a fenced front patio, such as the one shown below. 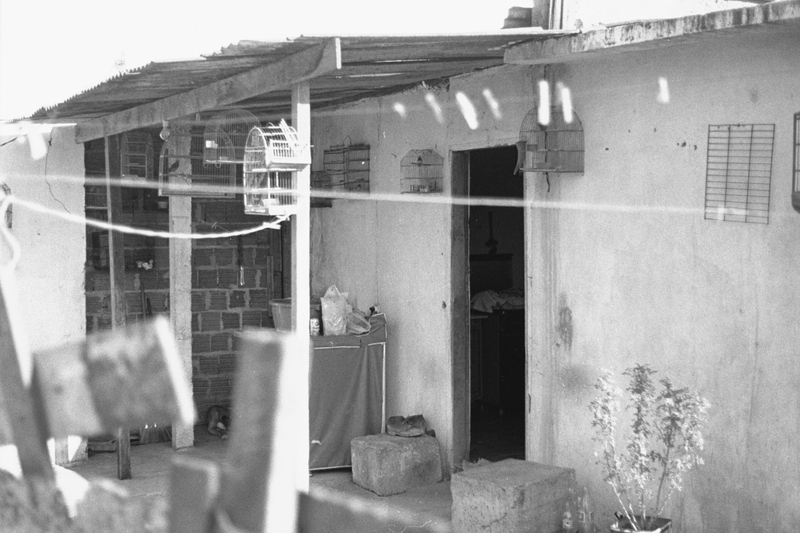 The small porch shown below, used for laundry and water storage, belonged to a family I got to know a little. The older kids could usually be found playing in the small circulation space just beyond the porch and hanging out on the stairs a few feet away (see last photo). And across the way, an even simpler solution: a laundry sink encroaching in the circulation space with a Dutch door for privacy. As I review these photos taken 15 years ago, before I began practicing architecture, I’m struck that the conclusion I arrived at then seems even more obvious now. I had based much of my analysis of these environments on Thomas Hubka’s and Amos Rapoport’s definitions of vernacular architecture and the processes by which it is designed, and concluded that these upgraded favelas could be considered vernacular architecture. But looking at these photos now it is even more obvious that the design solutions I documented are not very different from those that might be proposed by a professionally trained architect. We too work within the spatial and budget constraints of the project as we try to provide desirable amenities or a utility necessary for household functioning. We too try to design spaces that accommodate multiple uses and have certain tactile qualities. In cities with large informal settlements where zoning and building codes are nonexistent or not enforced, the idea of validating the design skills of “informal” designers may seem beside the point. My point is really that design, and designers, are everywhere, and that in looking at contexts unlike my own, where self-built structures are common, it becomes apparent that we may all learn from each other.